Oliver A. Howard — renowned Civil War general (Bull Run, Antietam, Gettysburg, Chancellorsville, Fredericksburg, Atlanta), Medal of Honor winner, head of the post-war Freedman’s Bureau, advocate for freed slaves, founder of Howard University—was born on November 8, 1830. The West Point grad became popularly known as “the Christian general” because his decisions were strongly influenced by his faith. 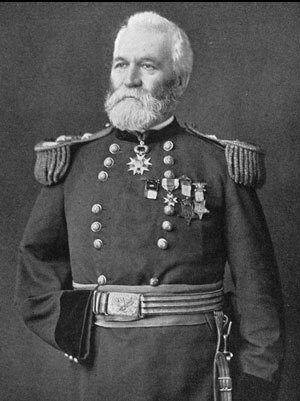 General Oliver Howard lost his right arm in an early Civil War battle. He was never United Brethren. Probably never attended a UB church. So why is he included here? Read on. After negotiating the surrender of Apache chief Cochise in 1872, Howard was sent to the Northwest in 1874 to subdue the Nez Perce Indians. 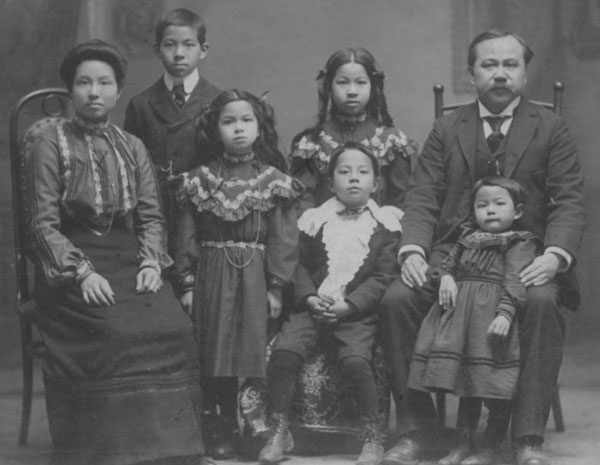 Howard’s daughter lived in Portland, and a young Chinese immigrant named Moy Ling was attached to the family in some way, probably as a worker. General Howard talked about Moy Ling in his autobiography. “I had not been in the city of Portland long before the active people in the different churches combined to form a union mission with a view to doing something for the Chinamen, who had already come in large numbers to that part of the Pacific Coast. “In my family, there was a young Chinaman of slender build, very dignified, and apparently independent. His name was Moy Yu Ling. One day I gave him a Bible printed in Chinese. He read it quietly without remark, but soon he joined the mission, became deeply interested, and united with one of the churches, and for over 25 years has been a consistent Christian and a local missionary to his own people in Portland. By 1882, the school Moy Ling had begun in 1876 was more than he could handle. The United Brethren church agreed to assume ownership. That served as our bridge to opening ministry in China—twice, as it turned out. Moy Ling’s school stayed with the “liberal” branch after the division of 1889. When they gave up the school in 1898, our group took charge. Twenty years later, Moy Ling’s contacts led us to Dr. Y. T. Chiu, and we again launched ministry in Canton, China—a ministry which later led us to Hong Kong…and Macau…and Myanmar…and Thailand. And it all started with a Civil War general giving a Bible to a Chinese immigrant.